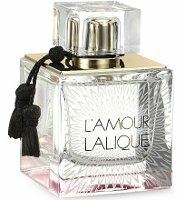 Composed by Nathalie Lorson, Lalique L'amour eau de parfum offers an olfactory declaration of love. The citrus freshness of bergamot, the elegant tenderness of a rosebud and the softness of neroli deliciously bursts at the top. The heart, crucial in a love story, enriches the fragrance with a bouquet of sumptuous white flowers: tuberose, gardenia and jasmine petals. The base highlights dry, warm cedar. The creamy softness of luscious sandalwood rests on a bed of addictive musks. Lalique L'Amour is available now at Selfridges, in 100 ml Eau de Parfum. Could well be! Great bottle.